Your next Web vision can’t operate without one, a cool and catchy Domain Name. Single one word domain names such as “Business.com” or “Vodka.com,” remember, are long, long forever gone. If you recall, business.com went to the highest bidder for $7+ Million, vodka.com for $3 Million. Overtime, if you’ve been on the marketing end of the Internet for any amount of time, most likely, you’ve also gathered your own stable of domain names for future development or resale. But managing or renewing them could eventually become cumbersome and expensive. So the end result is that many Web professionals will let these domains go, or just simply forget to renew them, and ultimately, these once valuable assets simply expire. So if you’ve made that mistake, and are wanting to get that domain name back again, you’ll most likely spend a bit of money, and time, to reacquire it. All of the domain names which are registered and then expire, goes through what’s known as the domain release process. So if the previous owner of that certain domain name doesn’t bother to renew or chooses not to renew it, it may then become available for bid, (more later). What that means is anyone who’s interested and aware, can acquire that or any other domain name that’s recently expired and released for public consumption. So if you’re looking for potentially valuable domain names or interested in protecting your brand, there are steps which you can take to secure these expired domains. 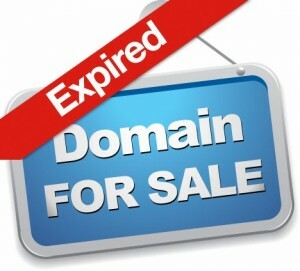 One other reason for learning the process of acquiring these expired domains is because these dormant domains can potentially be worth something, making it a valuable asset to own, provided you get in early and cheap enough. It’s also common for some expired domain names to come with their own visitor traffic, or even Google pagerank. This traffic can occur from natural search traffic, or most likely through previous user bookmarks, social media, or website backlinks. This visitor traffic is also usually focused and aligned towards the specific domain keyword as well. There’s an entire industry of experienced SEO marketers who acquires expired domains, just so they can potentially capitalize on the existing search or social media traffic, or just for immediate flipping to make a profit. Others feel that the search engines are now sophisticated enough to know that the domain name has changed hands, or will stop sending traffic to them if there’s a 301 or a 302 redirect. But the importance is knowing how to identify and then acquiring potentially valuable domain names, and knowing how to grab them early when they become available, which can serve as valuable assets for your business. Another scenario is if you somehow overlooked the renewal of your own existing domain, and about to become a victim of the domain release process, here are a few steps to get that domain back. To begin, it becomes essential to know the trail of acquiring these expired domain names. It’s important to understand the different stages of the domain name release process. First of all, these expired domain don’t become instantly available on the exact day that they expire. Registrars will typically hold on to them for approximately 30 to 40 days after the stated expiration date, then the domain name is expelled. Then they may hold the domain name for up to another 30 days, allowing the previous registrant one last opportunity to renew if they want. So the official release or “drop” and availability date of the expired domain may be almost impossible to track. There are however other methods of improving your chances of acquiring a specific domain name which has expired, before it actually re-enters the pool of available domains for registration. Like a used car, it’s recommended that you know it’s history. If you’re interested in securing a specific expired domain that’s about to expire, or even one you’ve previously owned, it may become important to find as much information as possible. To do so, there are a few services who does this, such as Freshdrop.net, who can provide you with detailed information from the registrars, which includes an estimated number of visitor traffic, the true Pagerank, and, at times, the revenue when it was active. The more history that you find about an expiring domain name the better. It also offers you a better chance on how you can potentially monetize from it. Once you’ve targeted and know the history of a particular expired domain that you’d like to secure, assuming that it’s pending deletion, you may need to back order that domain name. The registrar, where the soon to be expired domain name was previously registered, such as GoDaddy, always has first dibs. Then any other registrar can place a request for the domain. Expired domain services such as: NameJet, SnapNames, Pool, along with a host of others have partnered with the registrars, specifically for the purpose of delegating multiple requests for the burnt domain. There’s no way of knowing beforehand which of the registrar’s request will be granted, so having a backorder on all of these services should give you a better chance to acquire that domain name. Should there be others wanting that domain as well, which is common, it then enters into auction mode where the highest bidder will win the domain. Without question, purchasing expired domain names can potentially be a long gruesome and at times convoluted process. diligence, a bit of capital, patience and perseverance. But the potential payout can be enormous provided it works out.